For years and years people have been calling us at RustyBrick asking if we are Google and if we can provide Google support. I just had no idea why so many people every week would call us asking for Google support. The mystery has been solved! A guy called today and after me bugging him to explain how he found us, he finally told me it was on Google Image search. I've asked almost everyone who called us in the past, and they didn't know how they found our number. But this guy actually explained how they found our number. A blog post I wrote on my SEO blog has an image of the RustyBrick toll free number. 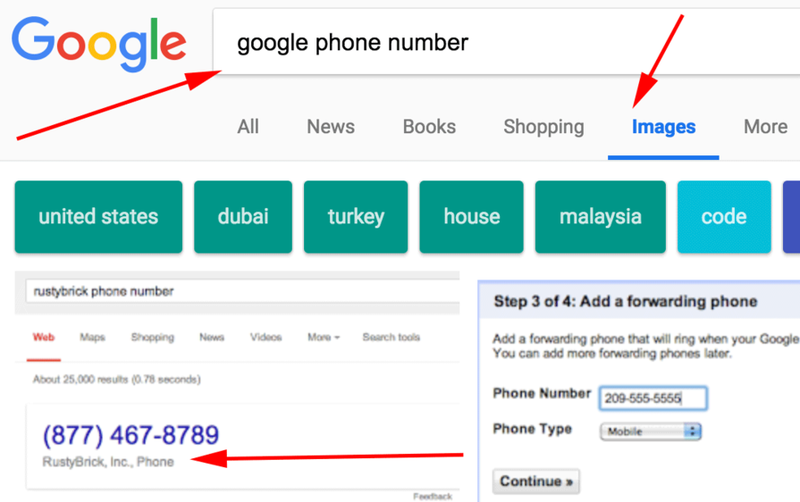 The file name of that image is google-phone-number-click, because I was covering how Google now has clickable phone numbers in their search results. But that image, that contains our phone number, also ranks number one in Google Image search for the query [google phone number]. Yes, the image also says right below the number that it is RustyBrick, Inc. Phone number. When you call the number, it also says this is "RustyBrick" but people still try to get Google support by calling that number. I guess I'll have to 404 that image and hope Google Image search drops the image. I can't believe that after all these years, it was Google Image search leading people to calling us for Google support! How eye opening!